Germany dealer: mainly sell heavy duty leather sewing machine, leather cutting machines and leather crafting tools for saddlery and leather crafts. France dealer: mainly sell heavy duty leather sewing machine and leather crafting tools for saddlery and leather crafts. They also sell heavy duty long arm zigzag sewing machine for sail making industry. Italy dealer: specialists in modifying, developing and marketing heavy duty zigzag sewing machine and long arm zigzag sewing machine for sail makers and repairs. As well as heavy duty automatic bar tacking machine for climbing ropes and rigging ropes. Spain dealer: mainly sell heavy duty leather sewing machine and leather crafting tools for saddlery and leather crafts. 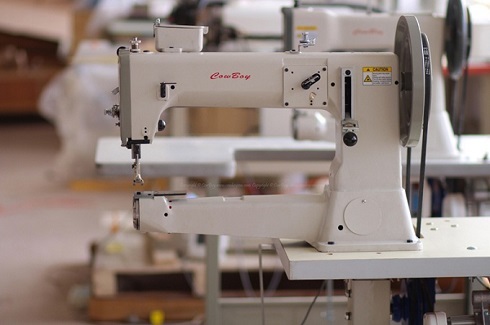 As well as automatic pattern sewing machines for ropes, slings and safety harness. UK dealer: mainly sell heavy duty leather sewing machine for UK saddle makers, as well thick thread upholstery sewing machine. 204-102MD Heavy duty, thick thread, ornamental stitching machine with 2 needles, for functional and ornamental stitching on leather sofas corners, armchairs, couches & suites. 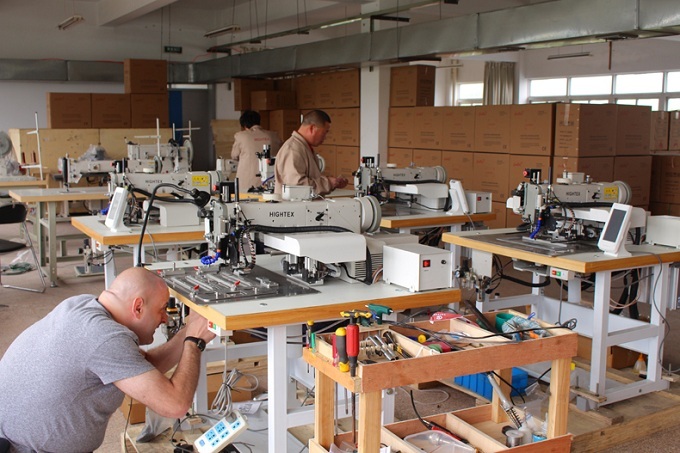 This special sofa sewing machine purchased by a big furniture manufacturer in Lushnje, Albania. 7700P Programmable ornamental stitching machine with 2 needles, for functional and ornamental stitching on leather sofas, shoe wear, suitcases and bags. This pattern sewing machine is ordered by a furniture manufacturing company in Yerevan, Armenia. 205-370BF thick thread upholstery sewing machine for decorative topstitching seams on leather and upholstery fabrics, in the production of sofas covers and car seat covers. This decorative stitching sewing machine is ordered by a furniture manufacturing company in Yerevan, Armenia. 71008R Heavy duty automatic rope sewing machine -- bar-tacking ropes and cordage for arborist climbing ropes, caving ropes, boating & marine ropes. This rope stitching machine ordered by arborist ropes manufacturer in Herk-de-Stad, Belgium and climbing ropes manufacturer in Lede, Belgium. 366-76-12-HM Extra heavy duty, long arm, zigzag sewing machine for sail makers and repairs. With cams for straight stitch, 1-step (2-points), 2-step (3-points), 3-step (4-points) zigzag. This long arm zigzag sewing machine purchased by a sail maker in Varna, Bulgaria. 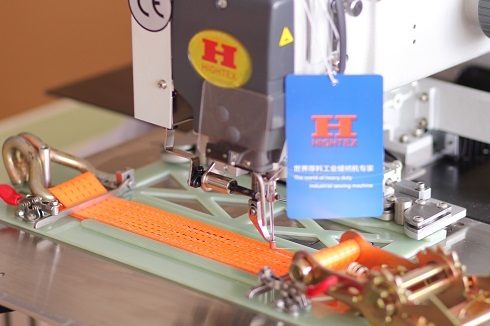 Hightex 204-102MD twin needle decorative stitching machine making your ideas a reality. The special roller presser foot can easily sewing corners of leather sofas & armchair, recliner chairs, leather car seat covers. 6 different cams for up to 12 different decorative stitches, including T-stitch, Box-stitch etc. This leather sofa ornamental stitching machine is purchased by producer of upholstered furniture and leather sofa in Lovech, Bulgaria. Hightex 204-370PRO Programmable post bed sewing machine twin needle, triple feed, crochet Barrel, suitable for twin needle seams and decorative seams on very thick materials and leather with braided thread. 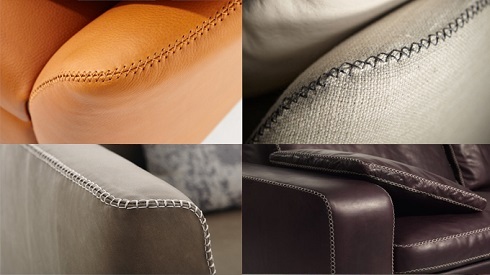 It is the computerized version of 204-370DP, various ornamental stitches can be realized for modern upholstered furniture. 7373BV Low cost extra heavy duty walking foot industrial sewing machine for stitching webbing slings, ratchet tie down straps and safety harness. 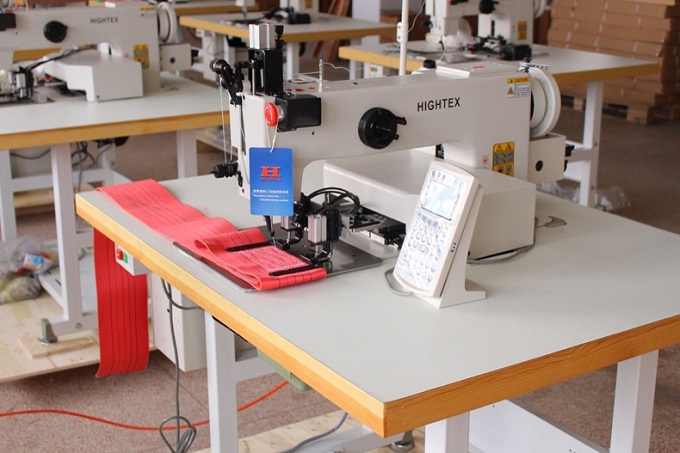 This industrial sewing machine ordered by a ropes-slings manufacturer, and a polyester webbing line producer in Varna, Bulgaria. 72008 Extra heavy duty programmable electronic pattern sewing machine for productions of synthetic slings made of Nylon and Polyester. 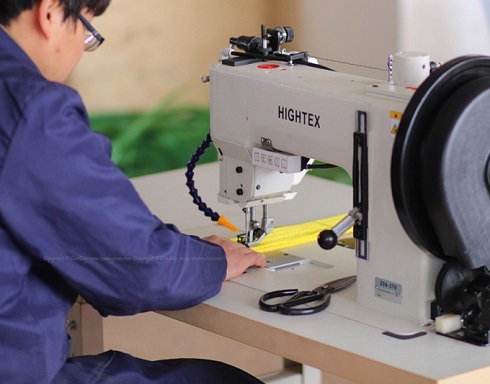 This heavy automatic pattern sewing machine ordered by a manufacturer of technical materials with PVC covering and textile webbing slings in Minsk, Belarus. 204-370 Heavy duty triple feed sewing machine for stitching 2-5 ply Nylon / Polyester slings in the production of lifting slings, harness and other webbing products. This webbing sewing machine ordered by a manufacturer of technical materials with PVC covering and textile webbing slings in Minsk, Belarus. 204-102MD Heavy duty, thick thread, 2 needles ornamental stitching machine, for functional and ornamental stitching on leather sofas corners, armchairs, couches & suites. This ornamental pattern sewing machine purchased by a Furniture factory in Brest area, Byelorussia. S700 Hot air PVC welding machine for inflatable products, such as inflatable boat, inflatable tents, pvc ventilation pipe, pvc duct pipe, inflatable castle, and inflatable advertising. 9518-30 Long arm zigzag sail making sewing machine for spinnakers and windsurf sail, with 4 cams for straight stitch, 1-step (2-points), 2-step (3-points), 3-step (4-points) zigzag. This spinnakers sewing machine purchased by a sail maker in Zagreb, Croatia . CB4500 Heavy duty cylinder bed, triple feed leather sewing machine for saddlery, harness, horse tacks, holsters, leather belts, sofas & armchairs and shoes. This leather sewing machine purchased by a big industrial sewing machine dealer in Czech Republic. CB243 Flat-bed, 1-needle, lockstitch machine with large shuttle-hook for extra heavy-weight materials, for sample saddlery, sofas & arm chairs, lifting slings and cargo lashing straps. This triple zigzag sail sewing machine purchased by a big industrial sewing machine dealer in Czech Republic. 733PLC Extremely heavy duty programmable electronic pattern sewing machine for stitching 8-ply slings with each of 3 mm, in production of parachute harness, safety harness, lifting slings and rigging belts. This super heavy duty pattern sewer purchased by a manufacturer of tactical clothing accessories for police and army in Mecin, Czech Republic. 75008 Heavy duty large area programmable automatic sewing machine for the production of ratchet tie down straps and endless slings. This automatic pattern sewing machine purchased by 3 manufacturers of lifting slings and tie down straps in Tallinn, Estonia. This leather sewing machine purchased by a industrial sewing machine dealer in Tiskre küla - Estonia. 9204ZZ Heavy duty walking foot Zig Zag sewing machine for carpets, rugs, blankets, upholstered furniture, shoes and attaching ropes to nets. This heavy duty zigzag sewing machine purchased by a manufacturer of unique weave rugs and plastic weave rugs in Lihula - ESTONIA. This automatic ratchet straps sewing machine purchased by a well known company in Vantaa, Finland. 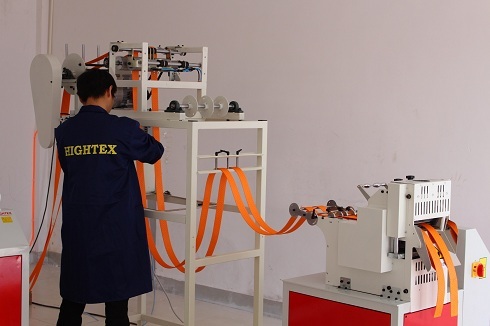 This robotic sewing unit will replace 2 workers, so you can reduce the cost of the lashing strap, improve quality and enlarge the production speed. These measures will enable you to compete with other manufacturers, both American, European and Asian (China), offering your customers high quality ratchet straps at low price. This specialized lashing strap sewing equipment purchased by a well known company in Vantaa, Finland. This heavy duty bar tacking machine ordered by a large safety rope manufacturer in Sainte Foy de Peyrolières, France, and a climbing rope manufacturer in Ernee, France. MLK500-2516 High speed automatic ratchet straps sewing machine. This machine can make a revolution in your sewing production of cargo lashing straps, safety harness and seat belts: High production efficiency due to its high speed provides high efficiency (1600 rpm); Large rotary hook with 3 times bobbin capacity; Easily sew with thick thread up to metric size #10 (=T-270, V277, 840dx3). 7273CNC/X Automatic heavy duty lashing straps sewing machine: this programmable pattern sewing machine is designed for heavy duty ratchet lashing straps (5T), one worker can operate 2 machines at same time, so you can reduce the cost of the finish product, improve quality and enlarge the production speed. These measures will enable you to compete with other manufacturers, both American, European and Asian (China), offering your customers high quality products at low prices. 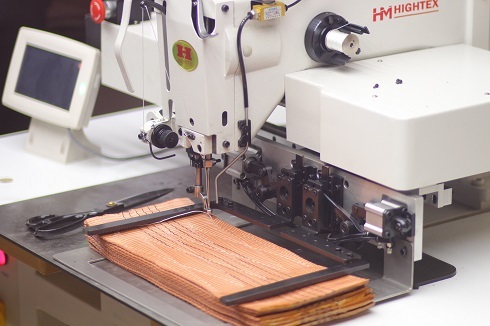 This specialized lashing strap sewing machine purchased by a company specialized the field of lifting and lashing systems in Debrecen, Hungary, Europe. 733CS extra high lift walking sewing machine and alternating presser foot for the produce synthetic slings, straps, harness, buffs and other difficult to sew materials. This heavy duty industrial sewing machine purchase by a buffing wheels manufacturer in Roscommon, Ireland. 71008R Heavy duty automatic rope sewing machine to make sewn eye termination on climbing ropes, caving ropes, rappelling rope, marine ropes and rescue ropes. This heavy duty bar tacking sewing machine purchased by a industrial sewing machine dealer in Vilnius, Lithuania. 9518-30 Long arm zigzag sewing machine for medium to heavy weight materials, such as spinnakers, windsurf sail and upholstery & interiors. This long arm zigzag sewing machine purchased by a manufacturer of sofas, cushions, pilot seats and canopies in Kaunas, Lithuania. 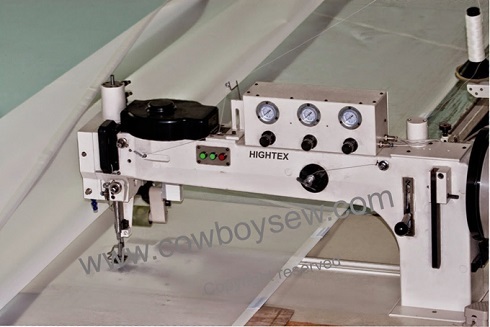 Hightex 828B Automatic hot knife webbing cutting machine for heavy duty lifting slings and straps:> this heavy duty industrial length cutting machine is designed for heat cutting 200mm webbing made of Nylon, Polyester, Polypropylene. The temperature of top and bottom heating blades is up to 600 C, can melting 10mm thick textile slings without any difficult. This automatic webbing straps cutting machine purchased by a manufacture of cordage, rope, twine and netting, in Rokiskis, Lithuania. 204-370 Heavy duty triple feed wood sewing machine for stitching plywood, ideal for furniture upholstery, especially when sewing heavy welt seam using extra thick decorative thread. This sofa sewing machine purchased by a leather sofa manufacturer in Skopje, Macedonia. This spinnakers sewing machine purchased by a sail maker in Dingli Malta Europe. This webbing sewing machine ordered by a producer of lashing and lifting solutions (fabricant de sangle d'arrimage et levage) in Hunedoara, Romania. GLK700-5030 Large area heavy duty programmable pattern sewing machine with large area (500×300mm), idea for sewing wide lifting slings, cargo lashing straps and other webbing straps. This heavy duty sewing automation equipment purchased by the manufacturer of polyester lifting and lashing products in Galati - Romania. 7273CNC/X High efficiency heavy duty automatic pattern taker for sewing 2 ratchet tie down straps (cargo lashing straps) at same time. 72600KSL-6V is an extra heavy duty large area CNC sewing machine for Narrow Fabrics Industry, such as lifting slings, Ratchet Tie Down (cargo lashing straps) and webbing nets. Hightex 204-370-DP Heavy duty post bed triple feed double needle lockstitch sewing machine with 2 large Barrel shuttle hook for ultra strong thread decorative seams on leather. Post bed leather sewing machine has been developed taking into account the requirements of the car seat manufacturers, armchairs and sofas. This thick thread leather sofas sewing machine purchased by professional industrial sewing machine dealer in Nova Pazova, SERBIA. This double needle sofas decorative stitch sewing machine purchased by professional industrial sewing machine dealer in Nova Pazova, SERBIA. 733BP Super heavy duty automated sewing machine with spiral sewing device for stitching very thick buffing wheels and polishing wheel made of sisal, flannel, cotton and cloth. This heavy duty sewing machine purchased by a producer of equipment for polishing in Arilje, Serbia. This spinnakers sewing machine purchased by a producer of shade-sails in Skofja Loka, Slovenia. This long arm zigzag sewing machine purchased by sail makers in Nova Gorica, Slovenija. This heavy duty bar tacking machine purchased by a manufacture of ropes and nets for protection in Callosa de Segura, Alicante, Spain. This heavy automatic pattern sewing machine ordered by a leading lifting and lashing manufacturer in Barcelona,Spain. And a manufacturer of textile lifting slings in Palencia, Spain. This webbing sewing machine purchased by a manufacturer of textile lifting slings in Palencia, Spain. This spinnakers sewing machine purchased by a sail maker in Ljungby, SWEDEN. And a professional sewing machine dealer in Gällstad, SWEDEN. 7273PLK/R New automatic thick rope end bartacking sewing machine ideal for joining 2 ropes with each of 6-22 mm(diameter) by stitching. 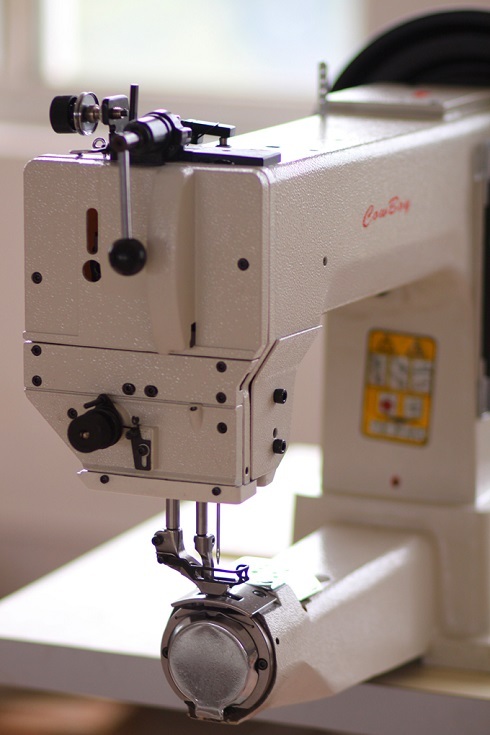 Several automated sewing machines can be run by a single operator reducing labor costs and increasing profits while providing pinpoint precision and accuracy. 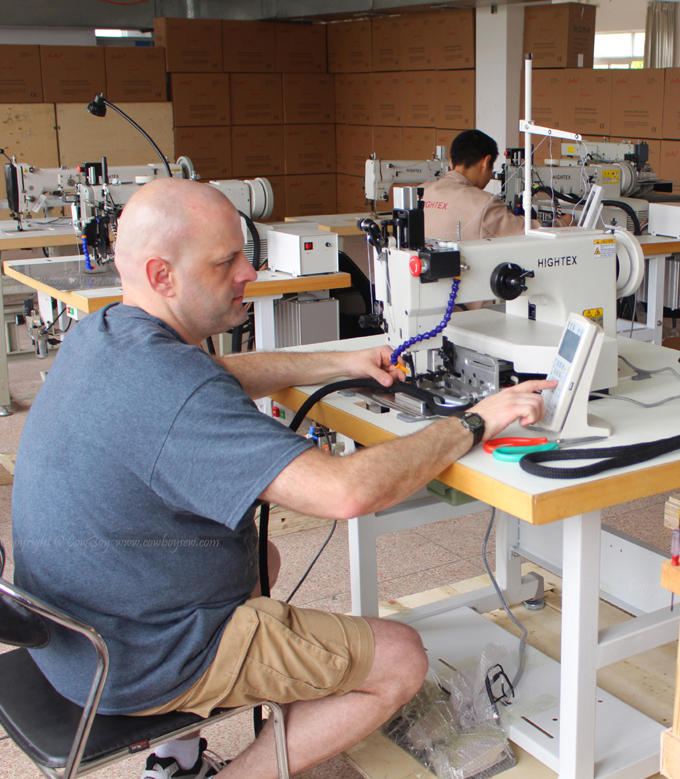 733PLC/R Heaviest automatic safety ropes sewing machine for sewn eye terminations. Design for stitching safety ropes from 10 to 28mm or 20mm thick Dyneema, Spectra, UHMWPE Rope, including offshore Ropes, mooring rope, tow ropes sewing machine and other marine ropes. This automatic CNC rope stitching machine purchased by a professional dealer of Cutting, Sewing & Welding equipment in Boras, Sweden. 9366-12 the greatest industrial straight stitch and zig-zag sewing machine for sail makers and repairs who are looking for an extra heavy duty 3-step zigzag machine. This triple zigzag sail making machine purchased by a sail maker in Romanshorn, Switzerland. 205-370AE premium leather sewing machine for saddle makers and leather workers. Sews leather, nylon, plastic coated webbing, canvas, and other man made material with ease! This heavy duty sewing machine purchased by a manufacture of sports goods and saddlery in Gibswil, Switzerland. Automatic lifting slings sewing machine, automatic rope end bar-backing sewing machine and automatic buffing wheel sewing machine, Check here for detail. 71008 Programmable pattern sewing machine for heavy weight webbing applications - webbing strap sewing machine and safety harness sewing machine. This heavy duty automatic sewing machine ordered by a lifting sling manufacturer in Kiev, Ukraine. 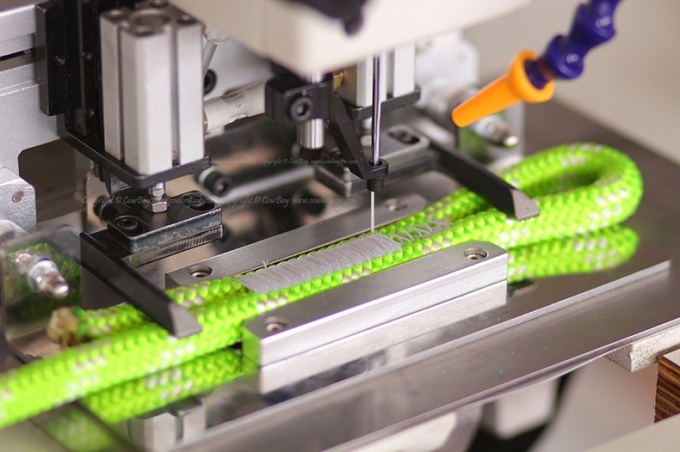 This automated rope stitching machine ordered by a climbing rope manufacturer in Kiev, Ukraine. GLK700-6040 Large field CNC-controlled pattern stitcher for heavy weight sewing applications, for example bulletproof vest (military tactical gear, Body Armor) and webbing nets. This automation equipment ordered by professional sewing machine dealer in Vyshneve, Ukraine. 7373ECO Low cost extra heavy duty walking foot industrial sewing machine for stitching lifting slings, cargo lashing straps and safety harness, Ratchet Tie Down straps. 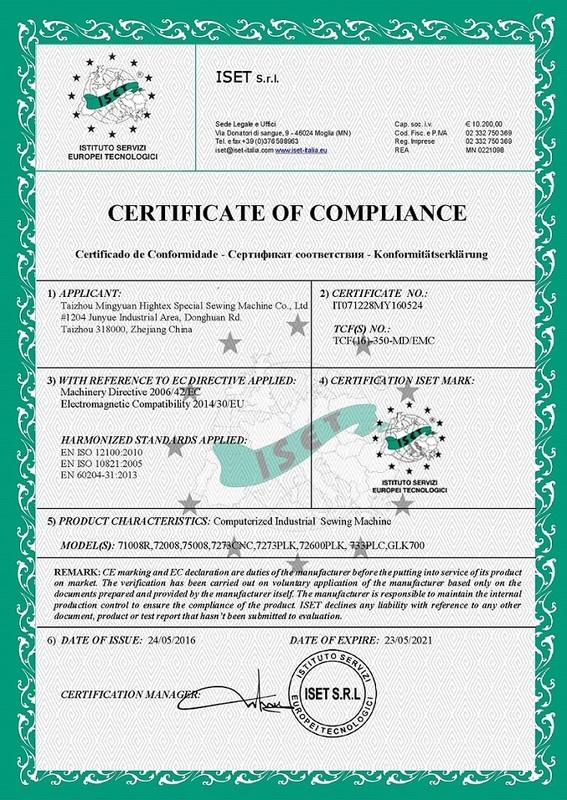 This industrial sewing machine ordered by a webbing sling manufacturer in Odessa, Ukraine. CB3200 Heavy duty cylinder bed, triple feed leather sewing machine with low cost, ideal for saddles, harness, horse tack, holsters, belts, pouches and leather crafts. This leather stitcher ordered by professional sewing machine dealer in Vyshneve, Ukraine.